Allow easy access to your backyard with a stylish gate installed by our Long Island fence company. We can also install a gate for your driveway or pool area as well. Leave it to East Coast Fence & Railings to provide an amazing job. Whether you are looking for something extravagant or rustic, we can perform the installation for you. We’re able to make custom gates for you from aluminum, PVC, wood, glass, and more. They can instantly be an attractive addition to your décor, or we can easily make them blend into the surrounding fence on your property. There are many reasons to install a new gate in your home. Whether you want to protect your driveway or perhaps simply need an attractive way to enter your backyard, our Long Island fence company will handle it all. Our gates are a fine way to provide entry when your business is enclosed with a fence, and will add professionalism. We can easily make it the focal point of your landscape or have it match the rest of the décor. Without a doubt, a rolling gate is the best way to protect your business after hours. It’ll easily roll up for your convenience when not in use. However, when in use, it’ll be extremely sturdy and resist graffiti. Our Long Island fence company offers various rolling gates for you to choose from, so you can find the perfect one for your business. Designed for you to walk through, our vast collection of walk gates can match any existing fencing you may have, or perhaps fencing that you would like to have installed. As a diverse fence company, we can provide you with ornate walk gate designs to perfectly complement your Long Island home and landscape. However, if you’re looking for something more subtle, we’d be happy to provide that as well. Adding an arbor can immediately add elegance to your fence and outdoor area. Our Long Island fence company’s arbors are all completely handcrafted, and are available in a wide range of materials as well as classic standards. You can rely on us to customize a completely unique arbor to suit your home. We also offer other creative details such as benches, cutout sections, and more. Spruce up the landscape of your backyard with a pergola. It can be a focal point or a common area without having to obscure natural light from the sun. Usually consisting of columns and an open, lattice-type roof, a pergola is a popular addition to a poolside landscape. Pergolas are often installed in gardens by our Long Island fence company as well. That’s because they offer many possibilities, as they can easily be painted in addition to being available in a number of materials and designs. You’ll be sure to find one that can beautifully complement your home. 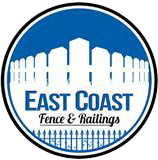 Give East Coast Fence & Railings a call today for a fully licensed and insured Long Island fence company. We’re available at 516-286-2236 and would be happy to offer you a free estimate.